Lightweight and easy to carry Since it can be safely done as installation work to a high place, it is effectively used. This review is about item#26895663. Anyway it is light. I use it on a tripod, but it is easy to lift it because it is light. Although the chain was thin, I was worried, but it looks okay. Because the chain is slightly long, I am concerned about tangling. It was smaller, lighter and convenient than I expected. I would like to purchase again. This review is about item#8235823. It is used for heavy objects in houses. I purchase two identical items and use it. It is safe and easy to lift heavy objects to a predetermined place. This review is about item#08235823. It is used for assisting the lifting of parts and materials, about 100 kg to 150 kg, by disassembling and assembling. 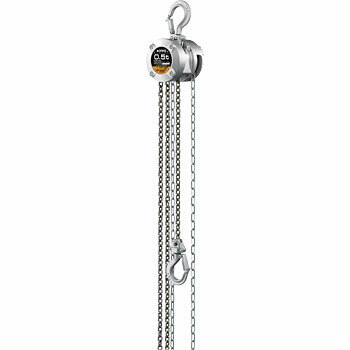 Hanging on the tip of a simple crane, it is also used to hoist the lifting load, it is easier than a winch. It is light and can be used anywhere immediately, with one hand you can easily carry it, so workability is also good. Compact side is also excellent, even in the car can be stored in a small space. The operation is also light, favorite. It is the second one in this time that it can be used conveniently.